The Tektronix P410 is a 10× passive voltage probe. Maximum voltage is 600 V peak-to-peak. It connects to the scope with a UHF connector. The "P400 Series" (not to be confused with the modern P400 probe) also includes P405 (5x), P420 (20x), P450 (50x), P450-L (50x extra low capacitance), and P4100 (100x). 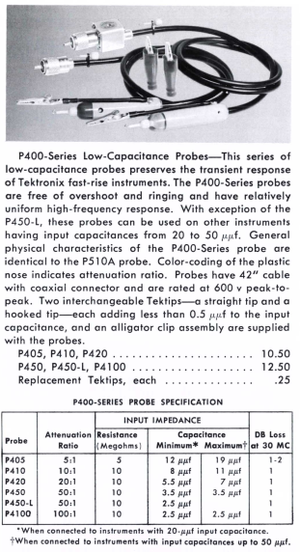 These probes were introduced in 1955 along with the Type 541 and Type 545 scopes because at 30 MHz, the P510A's 50 Ω coax cable exhibited unacceptable ringing due to the impedance mismatch at the scope's 1 MΩ input. It uses a special cable with a very thin, high-resistance center conductor which creates a better impedance match. All subsequent high-impedance probes use this kind of cable. This page was last edited on 6 August 2017, at 03:27.